Estoy bien contento y no sorprendido de esta noticia. Contento, pues por que toda la ayuda que pueda entrar al país es una buena ayuda. Lastimosamente siempre hay oposición y la oposición siempre contribuye con expectativas negativas. La historia muestra el inigualable apoyo y hermandad que ha demostrado la población estadounidense para con Honduras y la sub región de Centroamérica. No creo que es justo que extremos izquierda como James Petras y otros muchos izquierdistas y de oposición eterna (en el caso de Honduras) quieran demostrar miedo a Hondureños usando ejemplos de otros países para con actividades con los Militares Estadounidenses. Hondureños, agradezcamos que tenemos aliados como los Norte Americanos, Usted escoja, quiere a las fuerzas militares americanas dando apoyo y entrenando a nuestras fuerzas militares o quiere a las fuerzas militares venezolanas lo hagan? via Qué busca EE.UU. con su mayor despliegue militar en Centroamérica – BBC Mundo. I’m sharing this link with you all, it’s my opinion that everyone using Social Media should learn how to use it responsibly. Thanks to the #SMEM community and to Companies like @Dell and @Google who are engaging in #SMEM and crisis mapping. Here is the link: How PIOs Should Use Social Media in Disaster Situations. Useful link in time of crisis. My heart to everyone affected directly and indirectly from the #bostonmarathon bombing. Safe & Well. Regional Experts from Civil Protection Agencies and Emergency Management Agencies of the Central American, Caribbean and South America (Argentinian Blue Helmets), came together in Honduras, to exchange experiences, good practices and lessons learned in the efforts to increase resiliency, coordination and cooperation efforts. As part of the visit, the Honduran Emergency Management Agency COPECO, gave a tour of the modern installations that COPECO now has, to the Regional Experts. COPECO has, these past 3 years, been under the Direction of Minister Lisandro Rosales, and his efforts in advocating for funds, in the international community has proven great results in increasing capacity, capabilities and competencies. Because of the transparent and effective execution of international financial aid, Honduras, in the Emergency Management and Risk Management area, has become a Regional Model of Institutional Strengthening. EXPERTOS EN GESTION DE RIESGO DE CENTROAMERICA VISITAN COPECO | Comisión Permanente de Contingencias – COPECO – República de Honduras. Honduras is Ready to Receive & Coordinate Humanitarian Aid From the World!!! I am frequently amazed on how the (COPECO) Honduran Emergency Management Agency is getting better prepared. 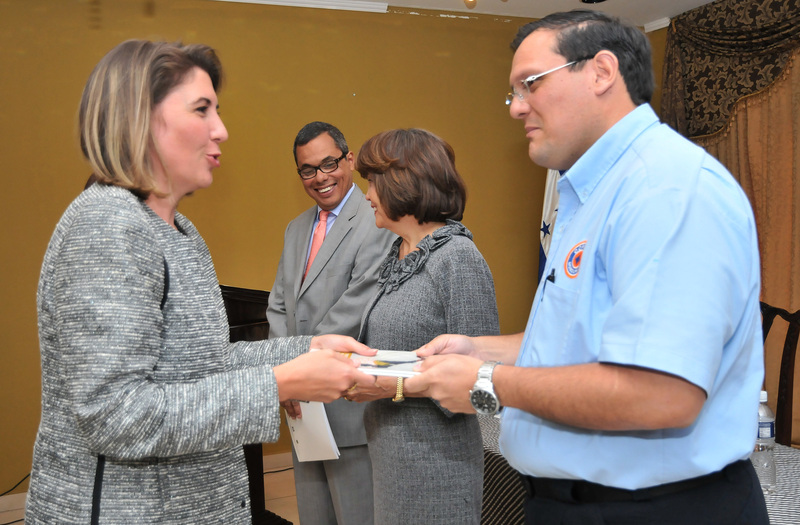 Today in Honduras, COPECO and the Foreign Relations Ministry, have duly presented, to the national authorities, as well as the International Cooperating Community and the Diplomatic Service in Honduras, the Manual for the Humanitarian Office of Foreign Aid Assistance and Coordination (Centro de Coordinación de Asistencia Humanitaria Internacional CCAHI). These types of formalities are needed in order, for the cooperating agencies, NGOs, countries and others willing to help, to better ask for and receive the incoming aid. “Cooperation With Dignity” is the Central American Slogan for Humanitarian Assistance, and with this CCAHI manual, cooperation is definitely expected to be better handled and ultimately distributed. How can we (as Emergency Management Agencies) better coordinate humanitarian assistance support? How often should we put the Manual to Practice (exercises, Table tops, functional, full-scale), and how flexible is the Manual in order to adapt to scalable situations/incidents that have already surpassed the capability of response? How often is the country overwhelmed with response and humanitarian capabilities? I wanted to share the Organization of American States’ weekly newsletter called “Disaster This Week”. The newsletter informs us of Hemispherical programs, good practices and Major Natura Events in the Americas.